“In nature, there are boundaries.” Legendary filmmaker Werner Herzog returns to his favorite theme, obsession, as he traces the story of Timothy Treadwell (1957-2003), an extremely eccentric amateur naturalist who spent 13 summers among wild brown bears at Katmai National Park & Preserve in Alaska. Treadwell and his girlfriend Amie Huguenard were tragically killed by one of the bears during the fall of 2003. 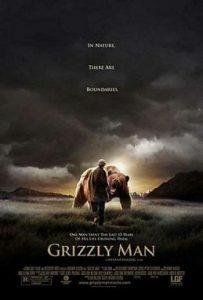 Grizzly Man is an extraordinary and haunting documentary full of astounding footage and some great introspective narration as Herzog expertly sums up the entire tragedy: “And what haunts me, is that in all the faces of all the bears that Treadwell ever filmed, I discover no kinship, no understanding, no mercy. I see only the overwhelming indifference of nature. To me, there is no such thing as a secret world of the bears. And this blank stare speaks only of a half-bored interest in food. But for Timothy Treadwell, this bear was a friend, a savior.” British singer-songwriter Richard Thompson provided the soundtrack for Grizzly Man, which premiered at the 2005 Sundance Film Festival. An aspiring actor, Treadwell claimed to have lost the role of “Woody” in Cheers to Woody Harrelson.